The fruit harvest has been variable this autumn. I’ve had no quinces on my trees at home, and as you may have seen in the orchard, we have suffered from bitter pit and apple scab. But the rosehips are shining out from the hedgerows. Apples and roses are closely botanically related – you can see this when you look at the structure of a rosehip, where you get the remains of the flower. It looks much like the bottom of an apple. 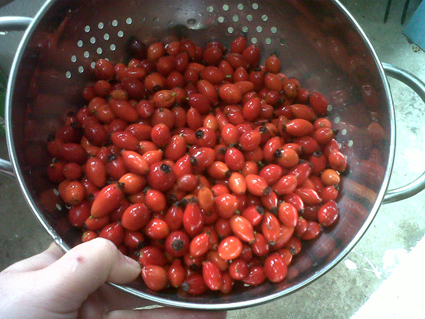 Rosehips are packed full of vitamin C, and also have a wonderful fruity, almost wine-like taste. You can make wine from them, or you can make syrup, which is what I’ve been doing this week. It takes a little time, but it’s very simple. 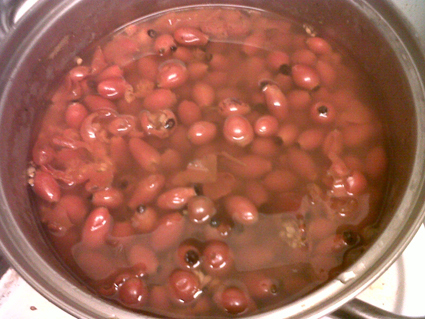 Bring the rosehips to a rolling boil in an equal quantity of water. They will take a long time to soften up, at least an hour, so keep an hour of them and top up the water now and then. 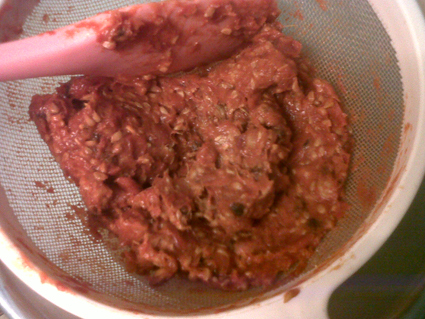 When the rosehips can be squashed with a spoon, tip them into a sieve (with a large bowl underneath!) and mash them through as much as you can. You will get left with a paste of pips, ends and, importantly, this will also remove most of the little irritant hairs that are in the rosehips. 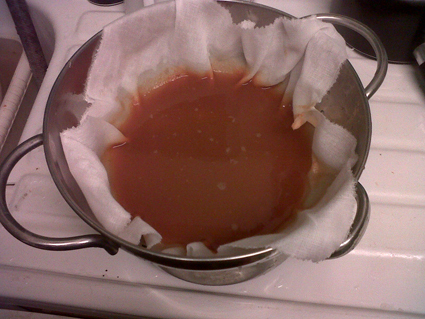 Then strain the rosehip juice through a square of muslin, back into your cleaned saucepan. To this filtered juice add a lot of sugar (hard to be precise – I have no scales, and you just have to do it to taste) and also the juice and a big chunk of peel of a lemon or an orange. Boil the juice until syrupy and reduced by about half. Let it cool, and pour it through a fresh square of muslin into a jug. 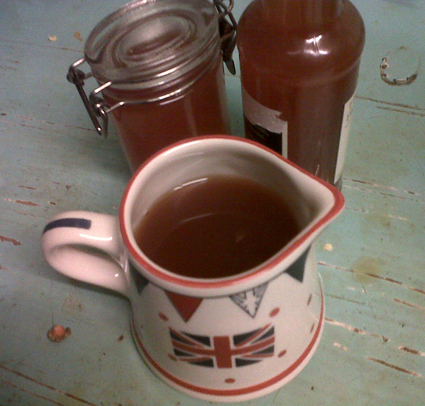 Then you can pour your finished syrup into clean containers. Have a spoonful a day to keep colds away, or use it as a sweetener for herb tea, or pour it over baked plums or apples.